Background: Laparoscopic Adrenalectomy (LA) is the gold standard approach for small sized adrenal tumors. Tumors larger than 6 cm harbor an increased risk of malignancy, and the oncological adequacy of the LA in these cases was not proven. In addition, the technical challenge, and hence the safety of the LA in large adrenal masses is questionable. Hypothesis: LA is technically safe and oncologically adequate for adrenal tumors larger than 6 cm. Methods: Retrospective review of patients who underwent LA for large adrenal tumors, defined as 6 cm or more per preoperative imaging or per intraoperative assessment, between 1997-2008. Results: Out of 200 LA performed during the study period, 40 patients met inclusion criteria. Right: left=22:18. Mean age: 52.9 years, range 11-81. Virilizing tumor, cystic mass, Adrenocortical Carcinoma (ACC), and Adrenocorticotropin Independent Macronodular Adrenocortical Hyperplasia – 1 (2.5%) patient each. Mean tumor size: 7.5±1.8, range 4.5-11cm. There were three (7.5%) conversions. Mean operative length: 156±61 minutes, excluding converted procedures. Mean length of stay: 4±1.5 days. Intraoperative complications: major and minor bleeding occurred in 2 (5%) and 4 (10%) patients, respectively. Postoperative complications (all minor) occurred in 8 (20%) patients. One patient with ACC died of CVA 7 days after surgery. Of the 3 patients with primary adrenal malignancies, no patient developed local recurrence, but one developed distant metastasis (follow up: 9-36 months). 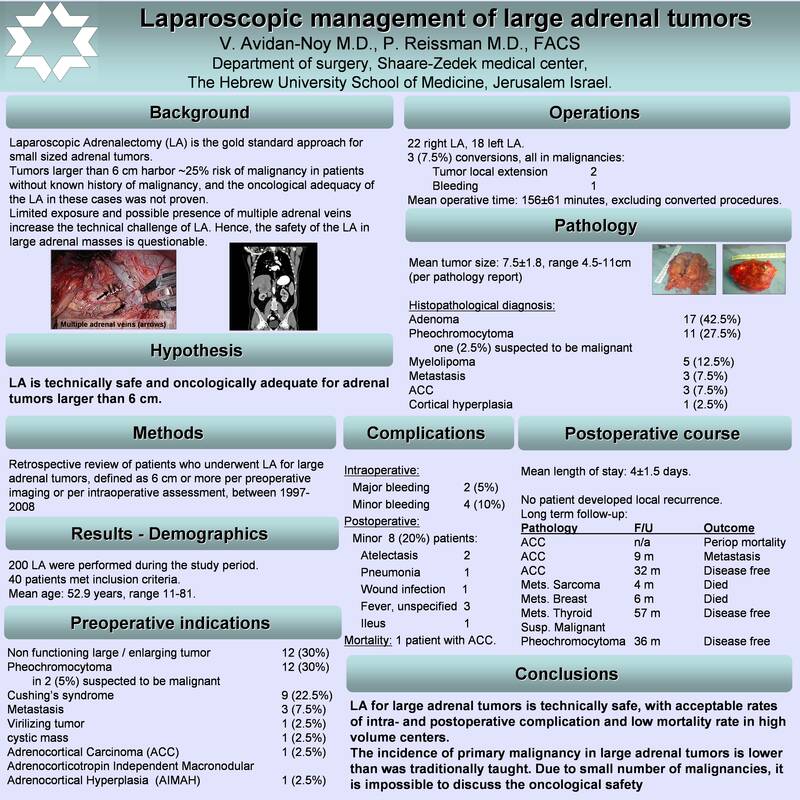 Conclusions: LA for large adrenal tumors is technically safe, with acceptable rates of intra- and postoperative complication and low mortality rate in high volume centers. The incidence of primary malignancy in large adrenal tumors is lower than was traditionally taught. Due to small number of malignancies, it is impossible to discuss the oncological safety.